Last month I posted a poll asking whether a service version TrueIP would be a useful thing to release. Although the poll did not get a lot of response, the few people who did vote chose yes, it would be useful. Since I felt like it would be a good challenge to learn how to develop a Windows service, I worked on it towards the end of June, even before the poll closed. Today I have posted a beta version to the site now for your use! I have been running it on both my home and work computers constantly for the past few weeks, and have not run into any issues, but I am considering it a beta version, since I have not ever developed and released a service-level application before. 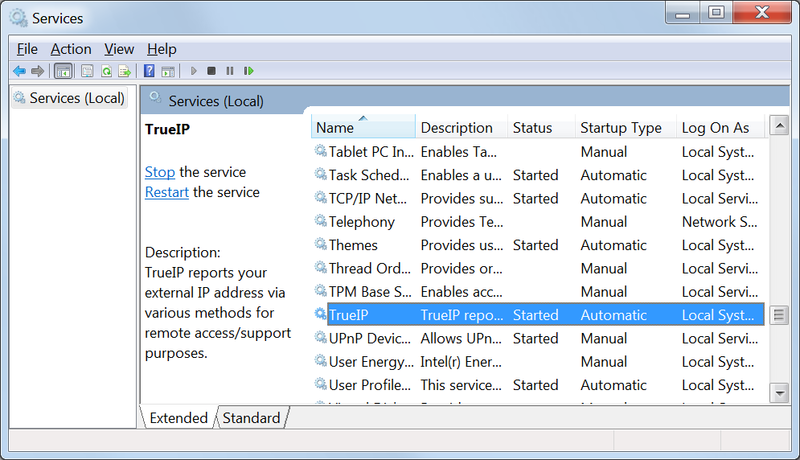 Anyway, I’ve added a section to the TrueIP page specifically for the service version. If you are interested, check it out to download the beta and if you have any issues, please report them. Happy IP logging!